The Flickr Blog is mostly pretty pictures. Every now and then there’s also a beautiful story. 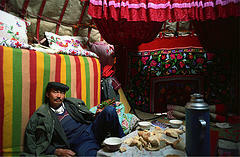 Rashit in his yurt. He spoke several languages and was always trying to learn more. When he found I spoke Spanish he spent hours learning new phrases from me and steering clear of smalltalk. "No talk, we learn. Word for horse." With so much yipping about 2-point-that and 3-point-this, it’s nice to be reminded of the values underlying all this technology — information, people and the world. I went to another WebInno event this evening in Kendall Square. I just moved back to the Boston area, and it’s fun to connect with other people here starting businesses on the web. In Boston, both sessions were at The Royal Sonesta; in NYC, the Tech Meetups I joined were in an NYU classroom and a cramped Meetup.com conference room. In Boston, just about everybody (including me) was wearing khakis and a buttondown; in NYC, it was jeans and hoodies. In Boston, at least half the crowd was from a VC shop; in NYC I remember bumping into one or two. In Boston, Dave ran efficient, orderly demos; in NYC the crowd jumped in with questions whenever they wanted — it was demo if you dare. How’s that for a list of generalizations?